This will be a two-hour yoga detox workshop. First, you’ll join Reika for an all-level yoga practice to detoxify your body and energize your system for the New Year! This yoga class will focus on twists, abdominal work, back bends, and breath work. Your metabolism will be activated as you are guided through a series of carefully selected yoga poses designed to stimulate and detox your digestive system and improve your circulation. Toxins will be flushed from the lymph system, thus helping to remove impurities from your body and then reboot it. You will be restored physically and emotionally. After the yoga session, you will feel an overall sense of heightened well-being. Josephine will lead a discussion on detox nutrition after the yoga practice. 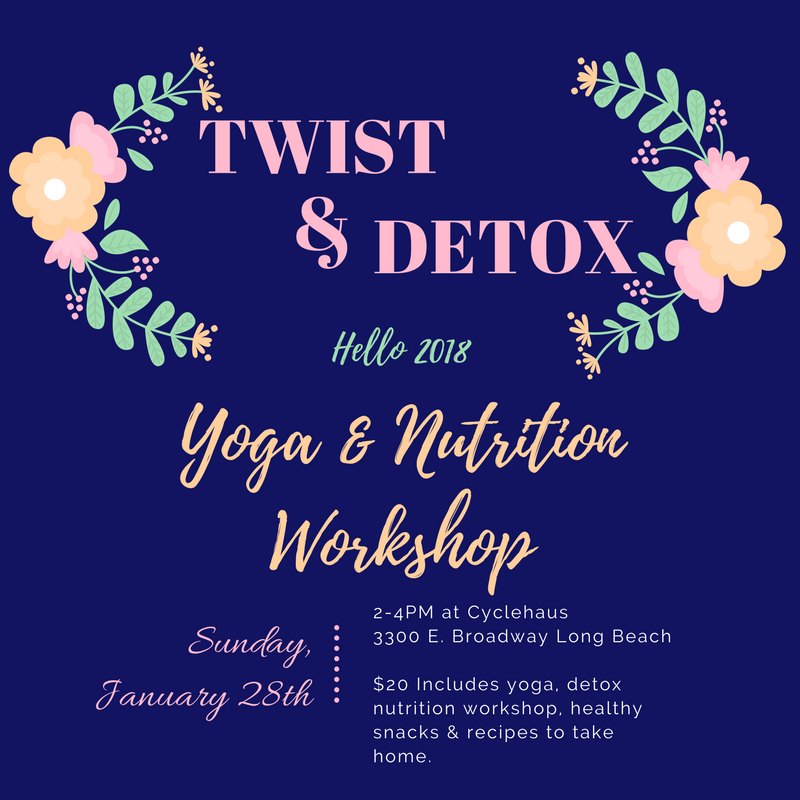 This portion of the workshop will explain in detail what detox actually entails, and how it improves your health by optimizing your strongest detox machine, your body! Josephine will explain which specific foods to add and/or eliminate from your diet. This advice follows a holistic eating approach to promote your body’s own natural cleansing processes. $20 includes; yoga, nutrition workshop, healthy detoxifying snacks, drinks, meal plan, and recipes. This is an excellent beginner's workshop for anyone new to yoga or for existing students who would like a refresher course. The workshop will cover the basics of yoga philosophy, introduce the different types of yoga, and explain the names, principles of alignment, balance, and breathing used in the most fundamental yoga poses. We will provide detailed instructions, with demonstrations, modifications, and hands-on-adjustments. The class will finish with a flow through the basic sun salutations. After attending this workshop students will feel comfortable in almost any regular yoga class. Be prepared to move your body, but there will be plenty of time to take notes and ask questions. FLOW into the Holiday Season with Mindful Yoga & Mindful Eating Workshop. This workshop will be led by Reika Shucart, a certified yoga teacher and Josephine Abe, a Registered Dietitian. Reika will introduce mindfulness with guided meditation and conscious yoga flow. After a short break, Josephine will lead a discussion on mindful eating over the Holidays. Josephine will conclude the workshop by presenting a mindful eating activity using homemade healthy holiday treats. Healthy holiday recipes and treats will be included in the workshop. I am offering free yoga class on the beach on Sunday 2/12. Even if you never done yoga before or don't own a yoga mat, it doesn't matter, just come :) It is just friends coming together on Sunday morning to enjoy the beautiful day together through yoga.